Inspired by the beauty surrounding her home in Northern California, Christina creates her exquisite hand-painted Christmas rose votive holder to bring the beauty of nature indoors. Each stunning glass vase is hand-painted in a dual technique with white Christmas roses and holly painted on the exterior and the gold background reverse-painted onto the inside of the glass. Each votive holder, a limited edition, is signed by the artist. No two will be exactly alike. Christinas love of nature is a life-long passion, sparked by happy memories of tending her parents' flower gardens. Today, she paints luminous flowers ''as if they are growing out of the ground and onto the glass,'' to be enjoyed all year round. 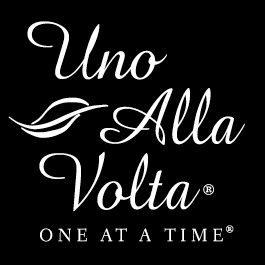 This Christmas Rose votive holder is masterfully handcrafted exclusively for Uno Alla Volta, from the heart and hands of the artisan. Votive holder measures approximately 4 inches x 4 inches. Inspired by the beauty surrounding her home in Northern California’s Sierra Nevada, Christina creates her exquisite hand-painted vases to bring the beauty of nature indoors. Her love of nature is a life-long passion, sparked by tending her parents’ flower and vegetable gardens. Today, she paints flowers “as if they are growing out of the ground and onto the glass,” to be enjoyed all year round.